Perhaps the best part about Logitech, these days, is the number of products on offer at differing price points. After the company purchased Astro Gaming last summer, it added a high-end line of stellar gaming cans, rivaling anyone in the industry, including Razer, Turtle Beach, and others. And to show off its newfound range in headset availability, the company sent us two to play with: the corded Logitech G433, and Astro’s A50 Wireless. There’s a lot to love, but we’re going to pit the two against one another in a death match of sorts instead. Not to spoil the ending, but Astro’s A50 is clearly the winner. But is it $200 better than the G433? Not necessarily. Convenience is a tricky topic. Is it more convenient to avoid wired devices that could lead to nasty accidents — for hardware, or user? Or is it more convenient to have a device that never needs charged? Right. Convenience means different things to different people. I typically prefer cordless devices, and the A50 was no exception. The lack of a cord dangling from my controller made it the clear-cut winner, but I’m also the guy that remembers to charge it every night when I’m done playing. That said, the battery life is excellent, offering about 11 hours of play time on average. For those that would rather not worry about keeping a device charged — or the secondary base required to use the headset with the PS4 — the G433 is probably your best bet. The G433 comes with a standard 3.5mm headphone jack that plugs easily into any PS4 controller. While the cord isn’t ideal, it’s certainly not as bad as it’d be if you had to plug into the PS4 itself, rather than the controller. Overall, I could certainly live with the cord. In fact, I sort of forgot about it entirely after a while. As sound goes, the A50 was again the winner. But, as is hopefully quite clear by anyone that’s ever read a headphone review, sound is super subjective. I found the A50 to be stellar, but is it $200 better than the G433? Absolutely not. Some of this, of course, could be due to the limitations of the PS4’s aging architecture, but the audio DSP is based on AMD’s TrueAudio technology, which certainly shouldn’t be much of a bottleneck for great headphones. I found the G433, with its 7.1 surround option, to be nearly as good as the A50 in terms of overall sound quality. Meaning, while it was certainly lacking in certain areas, it’s not enough to make me switch to the A50 if I was wearing the G433 at the time. 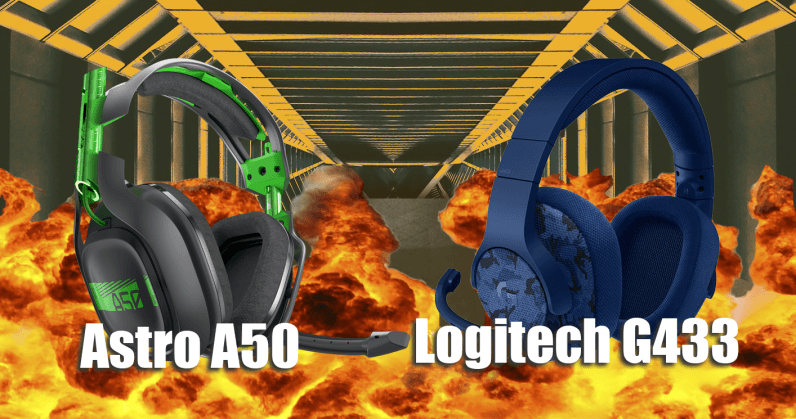 Gunshots, explosions, or a revving engine was fairly close on both headsets, but where the A50 truly shines is in delivering crisp, clear dialogue. Comfort is, again, subjective. But I found the A50 to be more comfortable over long play sessions than the G433. Both have oversized ear cups that eliminate some ear fatigue while wearing them, but the A50 adds a nice band at the top that helps disperse some of the weight evenly across your head. Meaning, you’re not getting that one spot on top of your head that’s shouldering the bulk of the weight, like you are with the G433. The ear cups are also slightly bigger on the G433 than the A50, although I didn’t find that to be much of a pro or con, just a style choice that didn’t make much of a difference one way or the other. The A50 offers 7.1 Dolby surround, a state 15 hour battery life (we experienced around 11), a fully wireless design. Well, a sort of fully wireless design: you’ll still need to plug the base unit into the back of the PS4 to transmit to the headphones. The cans use 5 Ghz wireless technology, which means it does a fairly good job of fighting through cluttered in-home airwaves to reach the headset without much in the way of interruption. It’s got a flip-to-mute microphone that’s a solid feature addition — I play without the microphone most of the time, but it was a nice feature to be able to just flip it into position and start talking if I needed it. The G433 set is a bit lacking in features, but does have the same 7.1 surround, only with DTS Headphone:X instead of Dolby. The website claims spatial awareness that places you in the middle of the action, although I didn’t find that it worked all that well, and I was still fairly confused at times about which direction sound was coming from if it wasn’t directly to my right or left. The noise-cancelling boom microphone has a built in pop filter, which is a bonus for clarity and those tricky “P” and “S” sounds that often come across muddled or overly loud in voice chat. I was a little let down by the look of the G433. For a headset as good as this one, the materials just felt dated and rather cheap. The A50, on the other hand, seemed premium. It looked overly “gamer” for me, with its multi-colored surfaces and industrial design, but for some that’s probably a benefit. Overall, I certainly wasn’t embarrassed to wear them, but if they were general purpose headphones they aren’t the type I’d want to take on an airplane — okay, maybe if I were a DJ. While it doesn’t have the standout features of the A50, you can certainly make the argument that the G433 is the better buy in terms of connectivity. I’m no fan of wires, but the benefit of the 3.5mm jack is that it works anywhere: in my PC, tablet, PS4, Xbox One, Nintendo Switch… any device with a headphone jack, basically. The A50 can’t make these claims, as it’s a one-trick pony. I’m told it’ll work with my PS4 as designed, but without forking over some extra cash for an Xbox-specific base, I can only get audio (no voice chat) if I wanted to switch over to another system. It does seem to work fine on my PC, however. Astro’s A50 also loses marks for its shoddy, at times, connectivity with the PS4. I find myself dropping in and out of games, though only briefly, several times during a two to three hour session. Each time the audio drops it comes back quickly, averaging just a second or two of lost audio, but sometimes those seconds matter, and it’s frustrating nonetheless. While it’s difficult to make the comparison between a $100 headset and a $300 headset, what I think surprised me most by comparing the two is how great a value the G433, by Logitech, really is. I still wish the company had made some better design decisions, and perhaps offered a tad more polish on the cheap-ish finishes, but for $100, it’s hard to suggest a better headset at this price point. As for the A50, well that’s a bit more complicated. It’s certainly great to look at, and the audio truly is stellar. But it’s in rarified air at $300, the type of place inhabited by the best-of-the-best gaming headsets on offer. It’s certainly the better headset of the two. But it should be for an extra $200, right? That’s questionable. For our money we’d still go with the Steelseries Arctis Pro Wireless for about $30 more.